Chicago Blackhawks sled hockey defenseman Josh Misiewicz knew his team had the upper hand. After all, his Blackhawks had five Paralympians, while his opponent, the Buffalo Sabres sled hockey team, had just two. When the final horn sounded, and the 9-2 score became final, the Blackhawks sled team celebrated its national championship title at the 14th Annual Toyota-USA Hockey Disabled Hockey Festival at the Leafs Ice Centre in West Dundee, Illinois. The team’s championship also capped off a weekend that preached team camaraderie and inclusiveness in the sport of hockey. 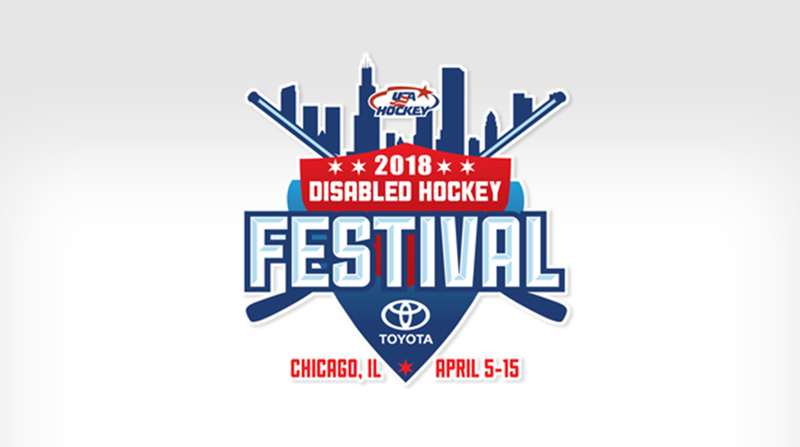 From April 12-15, the second weekend of the festival and one devoted all to sled hockey, national, adult and youth teams competed against each other in separate tournaments. Six national club teams competed against each other, with each team fielding their own members of the U.S. Paralympic Sled Team that won Paralympic gold in PyeongChang, South Korea, just over a month ago. Misiewicz, a first-time Paralympian in 2018, said the camaraderie he built with his fellow club players was strengthened by the Paralympics, as some of his teammates moved closer just to be a part of the club. “Jen Lee, the goalie, moved up here last here to train for the Paralympics and to make the Paralympic team,” Misiewicz said. Along with Lee and Misiewicz, Brody Roybal, Kevin McKee and Travis Dodson made up the five Paralympians on the Blackhawks team. That Blackhawks team went 4-0 over the weekend, scoring an average of eight goals per game and allowing just one goal per game. The championship also capped the sled hockey season, which began in September and carried on through the Paralympics before concluding here at the Disabled Hockey Festival. “We knew that we were going to train together and win a Paralympic gold medal together, so we were hopeful to translate that to a national title for our club team, and we did that,” Lee said. Lee, who started playing sled hockey in 2009, said one of the lasting parts of the weekend was the chance to play with and against his fellow Paralympians again. While this past weekend was all about sled hockey, the festival kicked off a week earlier and showcased other forms of disabled hockey, including those for players who were deaf, visually impaired, blind and standing amputees. Both Misiewicz and Lee said the Festival was a large success in part to the diversity of athletes that competed, which in turn help further the development of the sport of hockey. Lee also said the Festival was a great example of how much sled hockey has developed as a sport itself. “The sport has grown so much in the time I started playing,” Lee said. “It’s just great, just because you see kids from different disabilities, different age groups. Males, females, it doesn’t matter. Looking specifically at the national club teams, the Blackhawks and Sabres are both sponsored by the NHL clubs of the same name. For the last several seasons, the sled hockey season has started with the USA Hockey Sled Classic, presented by the NHL, which sees every participating team associated with an NHL team. While winning on the ice was the goal for the teams themselves, it also meant they would win for their specific programs as well, which also help sponsor other disabled hockey programs.